The Baltimore Light Rail is a light rail system serving Baltimore, Maryland, United States, as well as its surrounding suburbs. It is operated by the Maryland Transit Administration (MTA Maryland). In downtown Baltimore, it uses city streets. Outside the central portions of the city, the line is built on private rights-of-way, mostly from the defunct Northern Central Railway, Baltimore and Annapolis Railroad and Washington, Baltimore and Annapolis Electric Railway. The line is sometimes referred to the "Blue Line", or less commonly as the "Central Light Rail Line", even though the line carries three different routes on the same system: Hunt Valley-BWI (Blue), Hunt Valley-Cromwell (Yellow), and Penn Station-Camden Yards (Red). Beginning in the late 1980s, Governor William Donald Schaefer (a former mayor of Baltimore) pushed for building a transit line along this corridor, motivated in part by a desire to establish a rail transit link to the new downtown baseball park being built at Camden Yards for the Baltimore Orioles. The Light Rail lines were built quickly and inexpensively and without money from the U.S. federal government, a rarity in late 20th century U.S. transit projects. The initial system was a single 22.5-mile (36.2 km) line, all at grade except for a bridge over the Middle Branch of the Patapsco River just south of downtown Baltimore. The line ran from Timonium in Baltimore County in the north to Glen Burnie in Anne Arundel County in the south. 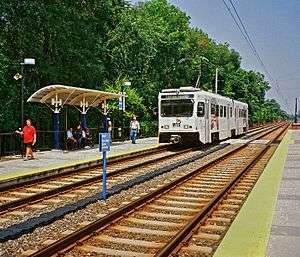 The Light Rail began service in April 1992, the same month that the Orioles began play at Camden Yards. Three extensions to the system were added in 1997. In September of that year, the line was extended north 4.5 miles (7.2 km) to Hunt Valley, adding five stations that served a major business park and a mall. In December, two short but important spurs were added to the system: one a 0.34 mile (550 m) spur in Baltimore that provided a link to Penn Station, a transit hub also served by MARC (Maryland Area Regional Commuter) and Amtrak trains, and the other a 2.7-mile (4.3 km) link that brought trains to the terminal of BWI Airport. In 1998, the Hamburg Street station opened as an infill station between the existing Westport and Camden Yards stations. Adjacent to M&T Bank Stadium, it was initially only open during Ravens games and other major stadium events; however, in 2005, it became a full-time stop. Although these routes are colored blue, red and yellow respectively on some MTA maps and schedules, they do not have official names as such. Some trains heading north from either BWI Airport or Cromwell/Glen Burnie may terminate at North Avenue to go out of service until peak operation hours resume. During these times, ridership is not high enough to send trains all the way through. Passengers must check train destination signs before boarding. Most of the light rail's route is on a dedicated right-of-way, with occasional grade crossings equipped with crossing gates. However, on the downtown portion of the route that runs along Howard Street (between the University of Baltimore/Mt. Royal and Camden Yards stations), trains mix with automobile traffic and their movement is controlled by traffic signals. In 2007, a transit signal priority system was implemented on this portion of the route, resulting in time savings of 25%. MTA fares are identical for the Metro Subway, the Light Rail, and local buses: a one-way trip costs $1.70. Daily, weekly and monthly unlimited-ride passes are also available that are good on all three transit modes. A passenger with a one-way ticket can change Light Rail trains if necessary to complete their journey — the only instance where a one-way MTA ticket is good for a ride on more than one vehicle — but transferring to a bus or the Metro Subway requires a new one-way fare or a pass. Automated ticket vending machines that sell tickets and passes are available at all Light Rail stations. The Light Rail's ticketing is based on a proof-of-payment system. Passengers must have a ticket or pass before boarding. Maryland Transit Administration Police officers ride some trains and randomly spot-check passengers to make sure that they are carrying a valid ticket or pass and can issue criminal citations for those without one. Civilian Fare Inspectors also conduct ticket checks, alighting those without fare. Most Light Rail stations are served by several MTA bus routes and passengers can make platform-to-platform transfers with the MARC Camden Line at Camden Yards and with the MARC Penn Line at Penn Station. There are no cross-platform connections with the Metro Subway. The Lexington Market subway and light rail stations are a block apart and connected only via surface streets. There are plans to cover the sidewalk between the two stations. Baltimore LRVs are quite large—much larger than traditional streetcars and bigger even than those used on San Francisco's Muni Metro or Boston's Green Line. Articulated cars are 95 feet (29 m) long (over coupler faces), 9.5 feet (2.9 m) wide, 12.5 feet (3.8 m) high with lowered pantographs and can accommodate 85 seated and 91 standing passengers. These cars operate on standard 4 ft 8 1⁄2 in (1,435 mm) gauge track. 1-, 2- and 3-car trains are all routinely seen in service. Trains are powered by an overhead pantograph and have a maximum speed of 60 miles per hour (97 km/h). When delivered, they were the first transit vehicles in the United States to employ A/C propulsion. Each LRV is powered by four 275 HP motors for a total of 1100 HP, the middle truck is unpowered. The MTA currently owns 53 individual Light Rail cars. During typical weekday peak-time service, approximately 30 to 35 cars are required; a somewhat higher number of cars are put into service immediately after Orioles and Ravens games. For weekday service, as well as on days of Orioles games or events at the 1st Mariner Arena or Baltimore Convention Center, trains going from Hunt Valley to Cromwell and BWI Airport are generally run with two cars, while three-car trains are put into service for Ravens games and major downtown events. Usually the Penn Station-Camden Yards shuttle is operated with one-car trains. The MTA also owns a variety of maintenance of way equipment, which can use diesel power in emergencies. There is a mid-life upgrade of the light rail vehicles currently in progress. On September 9, 2013, a contract for mid-life overhauls of the light rail vehicles was awarded to Alstom. Five vehicles at a time will be sent for rebuilding, involving testing, removal of all interior and exterior components and replacement with new propulsion systems. The overhaul is scheduled for completion in March 2018. The overhauled cars are expected to begin testing in early 2016. A northbound LRV departs Mt. Washington station. Outside the city center, the Light Rail has a dedicated right of way. There are plans to add an infill station at Texas, between the existing Timonium and Warren Road stations. A set of platforms was built at this point on the line in conjunction with the 2005 double-tracking work to provide a turn-back point for trains not going all the way to Hunt Valley; it would also be relatively simple to convert this into a revenue station. ↑ "2013 Annual Report" (PDF). MTA Maryland. p. 3-. Retrieved August 18, 2014. ↑ "Light rail". Department of Transportation Maryland Transit Administration. Retrieved 2015-04-25. ↑ Reflections in Motion Archived February 7, 2009, at the Wayback Machine. 2007 MTA Annual Report (PDF), page 12. Retrieved 2010-02-09. Archived February 7, 2009, at the Wayback Machine. ↑ "Trends in Transit Annual Report 2011" (PDF). Maryland Transit Administration. p. 24. Retrieved 2015-04-25. ↑ "Transit Matters annual report AR12" (PDF). Maryland Transit Administration. p. 6. Retrieved 2015-04-25. ↑ "Forward Focus Annual Report 2013 A Year in Review" (PDF). Maryland Transit Administration. p. 4. Retrieved 2015-04-25. ↑ "Nate Lawrence – Your light rail more seats leak and the... | Facebook". www.facebook.com. Retrieved 2015-08-06. ↑ "Baltimore Regional Rail System Plan" (PDF). Maryland Transit Administration. August 2002. Archived from the original (PDF) on September 9, 2011. ↑ "Home – MTA BaltimoreLink". Mta.maryland.gov. Retrieved 2016-06-29. ↑ "South Baltimore Gateway Master Plan". South Baltimore Gateway Master Plan. Retrieved 2016-06-29. ↑ "Kevin Plank's Sagamore Development reveals Port Covington master plan". Baltimore Sun. Retrieved 2016-06-29. ↑ "Baltimore Red Line". Maryland Transit Administration. Retrieved 2015-04-25. ↑ "Hogan says no to Red Line, yes to Purple". The Baltimore Sun. June 2015.